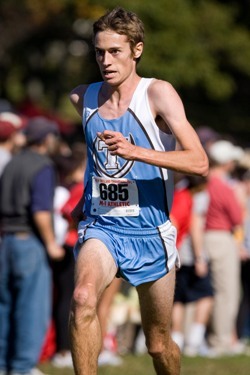 BOSTON -- Junior Jesse Faller (Burlington, MA) of the Tufts University men's cross country team was sixth overall at the 2008 New England Championship Race, the top finish among Division III competitors. He led the Jumbos to a 19th place finish as a team out of 47. Faller's time of 24:55 was only a hair behind fifth-place Duriel Hardy of Brown and was just a second behind the 24:54 time posted by fourth-place Kevin Gill of Stonehill. Tim Ritchie of Boston College won the 316-man race by one second with a 24:35 time. Junior Nick Welch (Seattle, WA) was the second Tufts finisher and 71st overall with a 25:55 time over eight kilometers. Junior Ryan Lena (Orono, ME) scored third for the Jumbos and was 132nd overall (26:34). Sophomore Jerzy Eisenberg-Guyot (Brookline, MA) continued as a consistent scorer for the Jumbos, running 147th overall in a 26:44 time. Classmate Chris Brunnquell (Harrington Park, NJ) was the fifth and final Tufts scorer, with his time of 26:59 taking 172nd. Tufts runs in the Plansky Invitational at Williams College next weekend.